At the outset, I wish to express my gratitude to Rabbi David Straus, the President of the Board of Rabbis, for his gracious words of welcome and to Father Gregory J. Fairbanks, Director of the Archdiocesan Office for Ecumenical and Religious Affairs, for his kind words of introduction. To Bishop Gordon D. Bennett, in the name of the Archdiocese of Baltimore, I express the warmest congratulations together with our heartfelt gratitude for your faithful, pastoral work among us…. To Archbishop Justin Rigali, a dear friend of many years and a great shepherd in the Church, I express my thanks for the personal invitation to be with you today…. 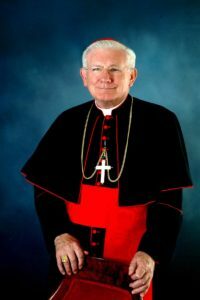 With gratitude and joy I acknowledge the new gift of Pope John Paul II to the Archdiocese of Baltimore in the appointment as Auxiliary Bishop of Bishop-elect W. Francis Malooly…. For Catholics, the Second Vatican Council gave great impulse to dialogue with other churches and other faiths. This dialogue entails personal discussions among committed individuals who are qualified to speak because of their knowledge of issues and their official positions within the faith groups they represent. Such dialogue draws on personal experience as well as our knowledge of scripture, tradition (for Catholics this tradition is expressed in conciliar and papal teaching through the centuries) and theology, and depends also and especially for success in the character and integrity of the participants. “On a global level there is often a prepackaged story” about the Church said Cardinal-designate William Keeler of Baltimore, president of the National Conference of Catholic Bishops and the U…. I am grateful to Cardinal Law for his endorsement of this afternoon of dialogue. To His Eminence the Church in our country is deeply indebted for his leadership in our early days of interfaith and ecumenical work. In recent years, it was Cardinal Law’s initiative which prepared the way for Catholic-Jewish dialogue in Poland and thus det in place the framework which helped those in Poland find their way out of the delicate situation created by the Carmelite Monastery near the Auschwitz-Birkenau death camp. As I thank Cardinal Hickey, a personal friend and a friend committed to interfaith amity, for his leadership in helping us to prepare for this program, I recall a grace we shared 25 years ago. Together we were witness to the moving Second Vatican Council discussions in the development of the document we celebrate in this colloquium, Nostra Aetate.